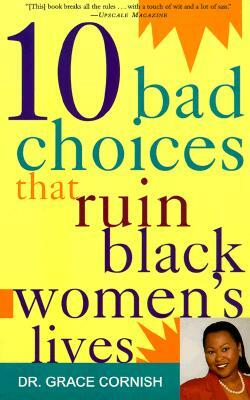 In her best-seller, 10 Bad Choices That Ruin Black Women's Lives, relationship expert Dr. Grace Cornish has written a lively, provocative guide for black women everywhere who want to shed the duds and find the studs who will treat them with respect. According to Dr. Cornish, six out of every ten black women are either in bad relationships, share a man, or are celibate. The problem is not the women themselves, she explains, but the bad choices they keep making. In this frank and refreshing book, Dr. Cornish speaks to unique aspects of the African-American female psyche by targeting ten of the most common and foolish choices black women make in their lives regarding men, and how they can correct these problems. Relying on case studies, interviews, and the letters she has received, Dr. Cornish gets to the heart of the matter by illuminating why black women, no matter how smart, savvy, and successful, continue to lose at the dating game, and how they can face, erase, and replace the problems that have kept them from finding true love. Dr. Grace Cornish is a psychologist, businesswoman, and writer. She has appeared on numerous programs, including Rolanda, Ricki Lake, and The Montel Williams Show, and is a regular on Good Day New York. Dr. Cornish, who travels around the world speaking to women about self-reliance and self-esteem, is also the author of Radiant Women of Color. She lives in New York City. "[This] book breaks all the rules . . . with a touch of wit and a lot of sass."